There is something sweet and calming about the seaside town of Carmel. It was the first little road trip that Boyfriend (now TM) and I took together when we were living in LA. We made s’mores using the fireplace in our hotel room, checked out the Monterey Bay Aquarium, Carmel Beach and drove back home on PCH through Big Sur and took a gazillion pictures of the view. There was something so lovely about that weekend getaway, Carmel has always been a place dear to my heart. Since then, we’ve moved up to the Bay Area, gotten married and have had many trips to Carmel in between. Randall invited us to Carmel this past weekend because his sister and BIL were in town visiting from SoCal. It was supposed to be our “chore weekend” so I had to convince TM that we’re allowed to have a little fun on the weekends and that we could go. We checked and the restaurants Randall had planned on going to were dog friendly so it worked out perfectly! Randall chose Casanova for dinner which was labeled as French Italian on Yelp. The front of the restaurant looked so quaint and cute and I wondered how we would be able to sit eight people and a dog together on their little front patio. I was shocked when we were led around the corner to the back entrance. Their restaurant extended all the way and was quite big! They had a lovely back patio with plenty of heaters for all the tables. We all ordered a large order of Gnocchi Casanova to share. Our server had mentioned that it is one of their signature dishes and it sounded really good. I had been eyeing it before our server even mentioned it. Instead of being made with potatoes as traditional gnocchi are, these were made from spinach. They were incredibly light and had a parmesan au gratin over it that we all dipped our bread in because it was oh-so-delicious. We even joked about drinking the rest with the spoon because it was that good! Unfortunately, I didn’t take a picture of it. TM ordered the Filet Duo as his main. It was a pan-seared filet, short rib crepinette with polenta. It had a Provencal topping and beef jus. 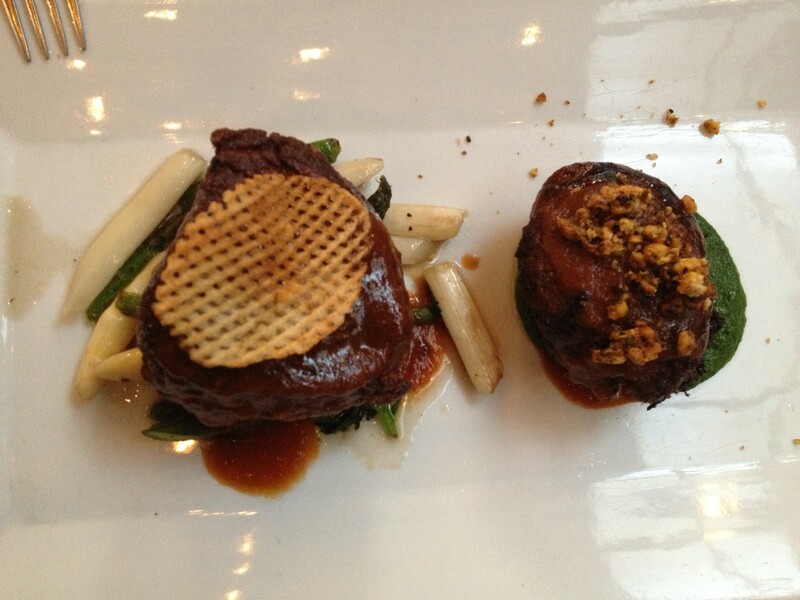 I only tried the short rib but it was incredibly soft and flavorful. TM said it was better than the filet. 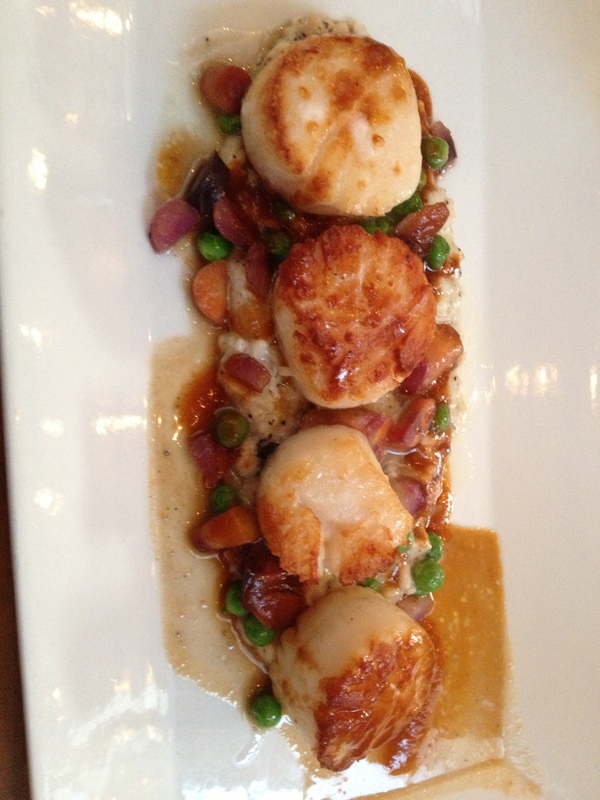 Three of us at our table chose the seared jumbo scallops as our entree. It came with mascarpone and black truffle risotto, spring pea & carrot ragu and a beef jus. The scallops were cooked perfectly and honestly, almost anything with mascarpone and black truffle has got to taste amazing. The risotto was no exception. I loved the food and ambiance at Casanova. We go to Carmel so often, I can definitely see us going to Casanova again. It was a huge plus that they allow dogs on their patio and even bring out a water bowl for your pup!